We’ve since hired a team to develop an Android version. They’re actively at work on it at the moment and are getting close to being done, so not too much longer! Sooner rather than later seems to be the ETA of this high-profile mobile game. 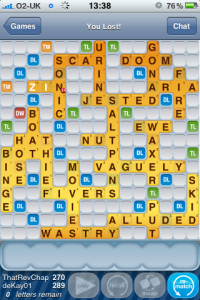 Android’s currently best offering to the online Scrabble gamers is Wordfeud. If Words With Friends for Android is cross-compatible with iOS, then Wordfeud will not remain the king for too long. Anyone excited for this port? This writer is!